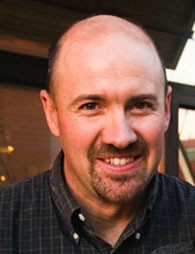 David is one of the founders and current Director of the California Straw Building Association (CASBA). He is past-President of Architects, Designers, and Planners for Social Responsibility (ADSPR) and served fror twelve years as a board member of the Solar Living Institute (SLI). He has taught and lectured on the subject of sustainable design for over twenty years. David is a native of Wisconsin and earned his B.Arch from the University of Minnesota. A licensed architect since 1991, he spent four years as project architect and planner with Van der Ryn Architects - most notably on the Real Goods Solar Living Center - and apprenticed with Obie Bowman at The Sea Ranch. While in graduate school at UC Berkeley he also worked with Peter Calthorpe and Dan Solomon, focusing on mixed-use, city and regional planning issues. David and Anni are married and live in a 100-year-old solar and wind-powered home in Albany, CA, where David served as a planning and zoning commissioner for over 10 years.